North-East Asian Subregional Programme for Environmental Cooperation (NEASPEC) is a comprehensive intergovernmental cooperation framework addressing environmental challenges in North-East Asia. 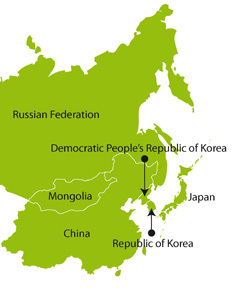 As a follow-up to the United Nations Conference on Environment and Development held in 1992, NEASPEC was established in 1993 by six member States - China, Democratic People's Republic of Korea, Japan, Mongolia, Republic of Korea, the Russian Federation - to promote environmental cooperation in the subregion. North-East Asian countries have been increasingly exposed to environmental problems coupled with the rapid economic growth of the recent decades. As the subregional cooperation framework, NEASPEC aims to redress the dichotomy between economic growth and environmental protection to improve environmental sustainability of the subregion. As the governing body of NEASPEC, SOM provides overall policy guidance and project coordination to NEASPEC by making policy decisions concerning all substantive and financial matters. SOM meets once a year in a member State on a rotational basis. UNESCAP has been providing secretariat service for NEASPEC since 1993. In May 2010, UNESCAP East and North-East Asia Office (ENEA) was established in Incheon, Republic of Korea. Upon the establishment of the office, NEASPEC relocated its secretariat from the ESCAP Headquarters to the ESCAP ENEA Office. In addition, the 16th Senior Officials Meeting endorsed the decision to change secretariat status from interim to permanent. The first Meeting of Senior Officials (SOM-1) in 1993 was the first attempt of its kind which addresses environmental issues in an official level in the subregion. Since then, through the consultation process in a series of SOMs, NEASPEC has developed its function as a policy dialogue forum which deals with environmental issues by identifying common concern among member States and pursuing environmental cooperation projects in the relevant fields, with the participation of senior officials from China, Japan, Mongolia, the Republic of Korea and the Russian Federation. SOM-1's principal contribution was the identification of three priority areas for cooperation, which included: a) Energy and air pollution; b) Ecosystem management, in particular deforestation and desertification; and c) Capacity-building. The Second Meeting of Senior Officials (SOM-2), held with the participation of the Democratic People's Republic of Korea (DPRK) in addition to China, Japan, Mongolia, Republic of Korea and Russian Federation, endorsed five priority (first phase) projects for implementation: a) Operations and Maintenance Training for Reduction of Sulphur Dioxide in Older Coal Fired Electricity Generation; b) Demonstration of Clean Coal-Fired Power Plant Technology; c) North-East Asian Biodiversity Management Programme; d) North-East Asian Seed Research and Information Base for Forests and Grasslands; e) Environmental Pollution Data Collection, Intercalibration, Standardization and Analysis. Out of the five projects identified, the Meeting urged that three projects be supported with funding from the Asian Development Bank (ADB) and ESCAP. These were: a) Training for Sulphur Dioxide Reduction in Coal-Fired Power Plants; b) Demonstration of Low-Air Pollution Coal-Fired Power Plant Technology; and c) Environmental Pollution-Data Collection, Comparability and Analysis. The third Meeting of Senior Officials (SOM-3) adopted a landmark framework for NEASPEC. Among other things, the Framework elaborated the geographical coverage, programme objectives, the functions and responsibilities of senior officials in promoting environmental cooperation, as well as coordination, management and financial mechanism of such cooperation. This was subsequently reported as a major subregional initiative to global environmental forums, including "Rio+5", the Special Session of the United Nations General Assembly held in New York in June 1997, which undertook a comprehensive review of the implementation of Agenda 21. The fourth Meeting of Senior Officials (SOM-4) endorsed four follow-up second phase projects, adopting a resolution which elaborated issues relating to the institutional and financial arrangements, making efforts towards financial arrangements, including a trust fund, and reaching a consensus on the modalities of the trust fund. The Meeting also proposed the establishment of two training centres in the Republic of Korea, which ultimately became known as the "North-East Asian Centre for Environmental Data and Training" hosted by the National Institute of Environmental Research and the "North-East Asian Training Centre for Pollution Reduction in Coal-fired Power Plants" hosted by the Korea Electric Power Research Institute (KEPRI). Additionally, four primary projects were identified for the follow up funding: a) Pollution Reduction in Coal-fired Power Plants; b) Environmental Monitoring, Data Collection, Comparability and Analysis; c) Efficiency Improvement of Electrostatic Precipitators in Existing Power Plants; and d) Demonstration of Dry Sorbent Duct Injection (DSDI) Flue Gas Desulphurization (FGD) Technology. The Fifth Meeting of Senior Officials (SOM-5) expressed that NEASPEC is the only subregional framework of its kind which promotes modest but practical environmental cooperation. The Meeting further stressed that cooperation among North-East Asian countries is indispensable for future generations as a means to realize a century of peace and prosperity provided that the opportunities in the framework would be fully utilized. The Meeting also recognized the urgent need for exchange of views on environmental policy matters among the neighboring countries and the promotion of sustainable development. It pointed out that the wealth of expertise should be fully utilized for promoting further cooperation. The senior officials also stated their preference for maintaining various subregional environmental cooperation activities recognizing the efforts at capacity building and information exchange. In addition, the Meeting reaffirmed that the four second phase projects should be built on the tangible results of the completed projects and urged each of the participating countries and collaborating agencies to continue the efforts and supports to those projects. The Sixth Meeting of Senior Officials (SOM-6) adopted the Vision Statement for Environmental Cooperation in North-East Asia. The Vision Statement, together with the Framework of NEASPEC, is seen as the main policy basis to NEASPEC in the 21st century. In this connection, the Meeting emphasized the need for further development of the present NEASPEC Framework into a more comprehensive programme for environmental cooperation, requesting the ESCAP Secretariat to administer a core fund in order to support projects adopted by the SOMs and reviewing titles of the three project components following the Technical Assistance Project funded by the ADB: a) Regional Training for Reducing Pollution from Coal-Fired Power Plants; b) Environmental Monitoring, Data Collection, Comparability and Analysis; and c) Action Plans for Improving the Efficiency of Particulate Abatement Systems in Existing Power Plants. The Seventh Meeting of Senior Officials (SOM-7) discussed ongoing projects as well as the subregion's preparation for the World Summit on Sustainable Development. It also considered three programmes that were proposed by the Secretariat, i.e. a) Comprehensive Clean Technology Programme; b) North-East Asia Nature Conservation Programme; and c) Environmental Monitoring and Data Collection Programme. The Eighth Meeting of Senior Officials (SOM-8) recognized the achievement of the NEASPEC projects on pollution control and environmental monitoring, data collection, comparability and analysis. It also recommended the initiation of the programme on nature conservation through the organization of an expert meeting and the establishment of a working group of national focal points to identify priority areas for development of projects on nature conservation and exchange of information on issues and problems. Moreover, SOM-8 supported the involvement of stakeholders and recognized several areas for action such as capacity building, exchange of information and expertise, data base management, scientific research and use of Geographical Information System (GIS). The Meeting also encouraged the development of the GEF project on dust and sand storms through collaborative efforts of international organizations and the increase of public awareness on NEASPEC at the national, regional and global levels. With the participation of China, Japan, Mongolia, the Republic of Korea and the Russian Federation, the ninth Senior Officials Meeting (SOM-9) reviewed the status of NEASPEC projects on Pollution Control and Monitoring and on Control of Dust and Sand Storms in North-East Asia. The Meeting decided to undertake activities in two out of eight initially identified priority areas, i.e. a) conservation and recovery of large mammals and threatened species; and b) conservation, monitoring and cooperative research on important migratory species. It recommended that the use of modern tools of information and communication technology should be promoted in data exchange, implementation of training programmes and documentation on the project activities through the NEASPEC website. With the participation of China, Japan, Mongolia, the Republic of Korea and the Russian Federation, the eleventh Senior Officials Meeting (SOM-11) reviewed a wide range of NEASPEC activities including the first NEASPEC environment ministers meeting held during the Fifth Ministerial Conference on Environment and Development in 2005 (MCED 2005), Framework for a Nature Conservation Programme in North-East Asia and Mitigation of Transboundary Air Pollution from Coal-Fired Power Plants, as well as the follow-up activities of MCED 2005 and projects on dust and sandstorm. Moreover, the Meeting discussed the proposals for future activities on emerging issues related to environmentally sustainable economic growth and North-East Asia Environment Outlook. The expenditure of NEASPEC Core Fund and the contributions of member States are also considered. Requested the Secretariat to develop knowledge sharing activities for the Eco-efficiency Partnership and prepare a concept paper regarding the proposed “Green University Award” programme for decision by member states. In addition to the review of programmes, SOM-16 reflected on the global, regional and national preparatory processes for the United Nations Conference on Sustainable Development (Rio+20) and hold discussions on its principal themes. Moreover, SOM-16 considered the new NEASPEC project proposals by member states, including Russia Federation’s proposal on Transboundary Air Pollution in North-East Asia and ROK’s proposals on Transboundary Marine Pollution and conservation of endangered migratory bird species. The seventeenth Senior Officials Meeting (SOM-17) supported the existing programmes on transboundary air pollution, nature conservation in transboundary areas (with focus on Amur tiger and leopard), and dust and sandstorms while specific activities will be further formulated/elaborated during 2013. In addition, the Meeting also endorsed proposals from the Secretariat of new initiatives including launching a marine protected areas network, protecting the key habitats of migratory birds, and launching the information platform for low-carbon cities. In addition, SOM-18 received the proposal of Mongolia entitled "A conservation strategy to achieve recovery of a critically endangered Gobi bear population in Mongolia" and noted the urgency of the proposed project activities. The most notable progress made at the nineteenth Senior Officials Meeting (SOM-19) included: formalizing target protected areas and operational modalities of the North-East Asia Marine Protected Areas Network (NEAMPAN), established during the last SOM; and launching the North-East Asia Low Carbon City Platform (NEA-LCCP) which will strengthen cooperation of agencies to collectively support cities and will synergize the works of stakeholders. Dust and sandstorms projects by NEASPEC since 2010 including capacity building activities. Participants also agreed on the development of mid/long-term strategic plan for NEASPEC for the next SOM for guiding NEASPEC to better serve the subregion in responding to domestic environmental challenges as well as contribute to global sustainable development processes. The development process of the strategic plan would involve consultation with member States. Transboundary Air Pollution: Following the implementation of the Project “Development of the Technical and Policy Frameworks for Transboundary Air Pollution Assessment and Abatement in North-East Asia”, SOM noted the plan to forumlate the concept for a new subregional framework during the first half of 2016. Nature Conservation: SOM was briefed on the progress of the two on-going projects, “Study on Transborder Movement of Amur Tigers and Leopards using Camera Trapping and Molecular Genetic Analysis” and “Conservation and Rehabilitation of Habitats for Key Migratory Birds in North-East Asia”. Marine Protected Areas: SOM was presented with the list of target MPAs for NEAMPAN and the plan for a workshop to share experiences in MPA management, to be held in June 2016 in Suncheon, ROK. Low Carbon Cities: The Meeting recognized the significant potential of low carbon cities to achieve nationally determined contributions in reducing greenhouse gas emissions. The Meeting recognized the North-East Asia Low Carbon City Platform (NEA-LCCP) as an open platform for organizations working on low carbon cities to jointly mobilize their efforts and adopted the Terms of Reference for the Platform. Desertification and Land Degradation: SOM welcomed the change of programme area title into Desertification and Land Degradation. It was briefed on the development of the North-East Asia Multistakeholder Plan (NEAMSP) and recognized the Plan as an important initiative and supported its implementation. The Meeting recommended NEASPEC to collaborate with multilateral mechanisms, such as through establishing communication with regional and global mechanisms, exploring approaches to obtain and utilize information, and integrating access to resources. NEASPEC Strategic Plan 2016-2020: The Meeting adopted the draft Strategic Plan and noted that specific projects/ activities under each programme will be developed in due course. The twenty first Senior Officials Meeting (SOM-21) underlined the linkages of NEASPEC with global goals including the Sustainable Development Goals (SDGs) and the Paris Climate Agreement. The Meeting also emphasized the significance of results-oriented projects and knowledge and experience sharing as well as the need the strengthen cooperation among member States on subregional environmental challenges. Transboundary Air Pollution: The Meeting noted the outcomes of the Project “Development of the Technical and Policy Frameworks for Transboundary Air Pollution Assessment and Abatement in North-East Asia”, in particular the proposal of the North-East Asia Clean Air Partnership (NEACAP). The Meeting emphasized the need for further consultation with member States on the development of NEACAP. Nature Conservation: The Meeting commended the concrete outcomes and contributions of two projects, “Study on Transborder Movement of Amur Tigers and Leopards using Camera Trapping and Molecular Genetic Analysis” and “Conservation and Rehabilitation of Habitats for Key Migratory Birds in North-East Asia”. These projects are essential to generate new critical knowledge, to build capacity and to raise awareness. As a follow-up to the two projects, the Meeting supported the proposed multi-stakeholder coordination activities and analytical study under the concept of connectivity conservation. The Meeting also noted that the Korea Environment Institute (KEI) and NEASPEC will implement a study on the environmental and institutional arrangement in transboundary habitats and biodiversity conservation. Marine Protected Areas: The Meeting noted the activities of NEAMPAN including the first workshop and the second Steering Committee Meeting which were held in Suncheon, ROK in 2016. The Meeting also noted the revision of the project proposal by the Russian Federation, “Strengthening the subregional cooperation through knowledge sharing on sustainable management of MPAs”. Low Carbon Cities: The Meeting supported the proposed: (i) peer review to be conducted at city-level, and (ii) comparative study to take place at national and subregional level, under the North-East Asia Low Carbon City Platform (NEA-LCCP). Desertification and Land Degradation (DLD): The Meeting noted the significance of the DLD challenge in the subregion and supported the proposal of the “Study on North-East Asia Land Degradation Neutrality and Sustainable Development”. Mongolia nominated the Institute of Geography and Geoecology and the Russian Federation nominated its Institute of Geography, Russian Academy of Sciences, to participate in the proposed Study and will further nominate another organization in due course.